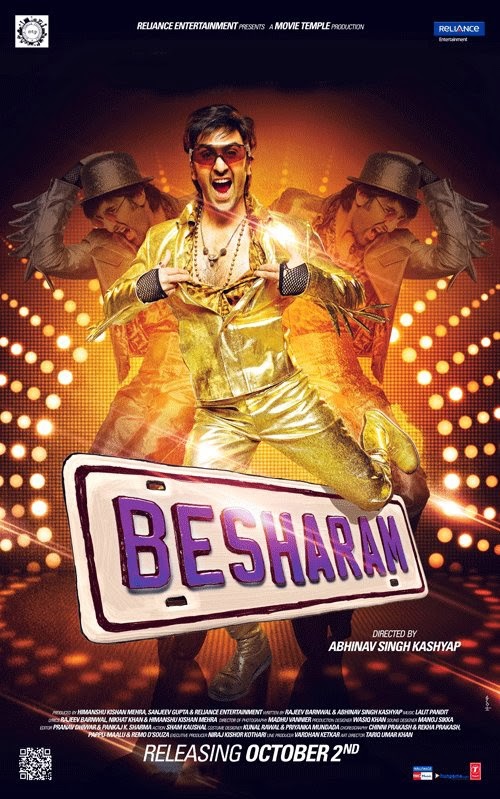 After drowning us with tears in emotional Rockstar, warming our hearts with delightful Barfi and entertaining us with romantic YJHD Ranbir Kapoor has apparently decided it was time to screw his reputation with Besharam. He is without a doubt my most favourite actor from the new generation (yes, even after this film), but truth to be told that only made the whole matter worse. I admit - I was not as appalled and horrified as I probably should have been, because appalled and horrified reviews kept coming from all sides and my expectations hit rock bottom. When I found some himmat to watch, I was ready for the WORST. The first half is decent - if we forget the disgusting morning erection scene and the most repulsive scene EVER (starring living legend Rishi Kapoor and a toilet) which was not needed and pretty much an INSULT to all his fans. Ranbir is acting well (even though his character is a disgusting creep for most part) and the new girl can dance. And Rishi Kapoor is the one who gives you a few chuckles (when he is not doing potty). The story is extremely weak, and even though one is not supposed to look for logic in these kind of movies, the stupidity of actions these people go to is just too much. There was no need to steal the car again, at least not once the girl knew the truth. And did they really think they couldn´t be tracked down? Did they really think nobody would look for the money? The bones of this plot are rusty, and the tofu you are trying to plaster on them ain´t no meat. So what that Babli is an orphan. How does that justify him being a thief? And that he gives everything to the orphanage makes even less sense - he could be doing any honest job and do the same. In other words Babli is a thief - because he likes it. There is no majboori involved, no matter how much they are trying to shovel that into your throat. I will do something I usually hate when others do it and say that Pallavi Sharda is just not beautiful enough. Not for this movie. She IS pretty and she is not a bad actress at all, however this role called for a STUNNING lady that would just catch your eye immediately. And Pallavi does not have this quality. She completely lacks star quality and is very bland. She shares no chemistry with Ranbir (obsessed with his crotch be it in the songs or otherwise) whatsoever, and their love story is very much awkward and superficial. It doesn´t feel natural at all, has no progress. The girl is treated just bad in the whole movie. She is pursued by the hero because of no other reason than her looks. He is stalking her even though she several times rejects him and makes it clear she has no interest in him whatsoever. Later in the film she is deceived and lied to. And when she gets upset - SHE is the one who gets lectured on being spoilt, heartless and cold. WTF?! Sexist much director saab? Neetu Singh.... the pyaari Neetu.... got the worst character in the film and is pretty much stripped of all her grace and ellegance. She was obnoxious and annoying and unfortunately only PARTLY because her character sucked. One of the main attractions of the film was the fact the three Kapoors were starring together in it - for the first time ever - but in the end it makes everything even more sad. In the end I can only say that not even super low expectations save anything - except perhaps it doesn´t make you that mad. It also doesn´t guarantee you will not want to barf at the toilet scene. Besharam Abhinav Kashyap took us for a ride and drove so recklessly we all can only feel sick. All the reviews on this blog are my personal opinions. If you can´t respect that, kindly see yourself out. Gaja Gamini. Ethereal theme. Theme images by Storman. Powered by Blogger.